Hungry For Happiness Mobile Tour And $30 Arby's Giveaway! You are here: Home / Expired / Hungry For Happiness Mobile Tour And $30 Arby’s Giveaway! Hungry For Happiness Mobile Tour And $30 Arby’s Giveaway! 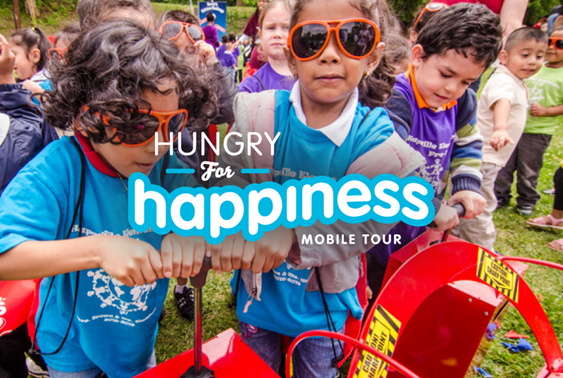 On Monday, May 12, the Hungry for Happiness mobile tour will visit Dallas to help raise awareness about the issue of childhood hunger and increase participation in FREE summer meals sites for kids located in the area. Summer continues to be a vulnerable time for those who rely on school breakfast and lunch during the school year. The Arby’s Foundation, the charitable arm of Arby’s Restaurant Group, Inc., in partnership with Share Our Strength’s No Kid Hungry® campaign, is committed to helping kids get the food they need. In Dallas, many school children who rely on FREE or reduced-price school lunches during the school year currently participate in summer meal programs. These FREE programs are available to kids and teens age 18 and under at thousands of summer meals sites across the country. Sites are registered with USDA and are held at safe local places such as schools, churches and community centers. In each market, the tour will provide Arby’s® Kids Meals (which are endorsed by Kids LiveWell and include a Jr. turkey and cheese sandwich, apple slices and Shamrock Farms low-fat milk) to children participating in the summer meals program, distribute information on local resources to the public, and provide fun summer activities such as hula-hoop contests, tug of war, bean bag toss, basketball and other family-friendly games to get kids moving. Families in Dallas can find a FREE summer meals site near them by visiting NoKidHungry.org/summer, calling 1-866-3HUNGRY, or texting FOOD to 877-877. Dallas is one of 30 stops on the national 2014 Hungry for Happiness mobile tour. National sponsors supporting the mobile tour include Pepsi, Dr Pepper and Shamrock Farms. Arby’s is the largest quick service restaurant chain to partner in a nationwide effort with Share Our Strength’s No Kid Hungry campaign, and has raised more than $9 million for its mission since 2011. Arby’s and the Arby’s Foundation have generated significant national awareness of the childhood hunger movement by leveraging its restaurants and digital and social media properties in the fight to end childhood hunger in America. The Arby’s Foundation, whose mission is to end childhood hunger in America, is the charitable arm of Arby’s Restaurant Group, Inc. Building on a philanthropic heritage that has contributed more than $57 million to child-related causes since its inception in 1986, the Arby’s Foundation has launched a bold new movement to educate, mobilize and empower Americans with the knowledge and resources needed to ensure food security for every single child. With more than 16.7 million U.S. children—more than 1 in 5—facing hunger daily, the Arby’s Foundation has devoted its resources to providing education and access to wholesome food choices for children across the country. The Arby’s Foundation is a registered 501 (c) (3) organization headquartered in Atlanta, Georgia. To learn more, visit www.arbysfoundation.org. Mandatory Entry: Leave a comment here telling us your favorite childhood memory. 1. Sign up to receive Dian’s Daily Deals in your email <—- Click Here and sign up – then come back here and leave a comment saying you did. 2. Follow Grocery Shop For FREE on Twitter <—- Click Here and follow us- then come back here and leave a comment saying you did. 3. Add Grocery Shop For FREE to your RSS Feed <—- Click Here and add us – then come back here and leave a comment saying you did. 4. Follow Grocery Shop For FREE on Pinterest <—- Click Here and follow us – then come back here and leave a comment saying you did. 5. Like Grocery Shop For FREE on Facebook <—- Click Here and Like us – then come back here and leave a comment saying you did. 6. Follow us on Instagram <— Click Here and follow us – then come back here and leave a comment saying that you did. You can do #’s 7-8 once daily – just make sure to come back and comment after each time to get an extra entry! This giveaway will end Saturday, May 24th, 2014 at 11:59 pm Central time and the winner will be emailed soon thereafter. Make sure you add [email protected] to your address book, so you get the email if you win! As an only child, travelling with my parents to meet my grandmother, uncles, aunts and cousins in Norway. This is my only post since I do not belong to any social media sites. My favorite childhood memory was going to the beach with my mom and brothers. My mom would make the best hotdogs ever and we’d eat them after we swam. I loved sleep overs at my best friend’s house! I love my memories of playing with my dogs in the yard and riding my bike up and down the block! Road trips to grandma’s house on Sunday. I remember having a blast going to camp in the summer as a kid. Living in the countryside with my grandparents was my favorite childhood memory. Not sure if my tweet showed up. It just said blank page, so here it is again. As a child my family always went camping every summer. My favorite memory is going to my Aunt and Uncle’s farm in Pennsylvania with my Grandmother. I loved picking blackberries with my cousins and playing in the fields. my favorite childhood memory was going to disneyworld for the first time.